Do you feel like you're chasing your tail – reacting to every up and down in your performance data? Do you get frustrated with being asked to come up with explanations for every “below average” data point or any day that doesn't hit the target? Are people in your organization wasting time chasing metrics instead of working to systematically improve the system? This workshop will show you and your leaders a better way. 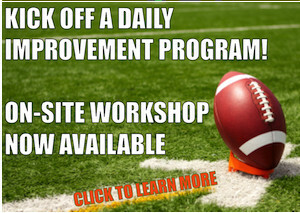 If so, I have a workshop for you! Bring this to your organization. Sometimes we just call it “Measures of Success: React Less, Lead Better, Improve More” like the book. Bring this to your organization or event. An expanded two-day session that includes topics in Lean Daily Management and Strategy Deployment. The full-day is not a lecture-only session. It's a hands-on working session that's customized for your organization. Mark Graban will work with and coach supervisors, managers, directors, VPs, and executives through this unique approach. The material in this interactive workshop is built upon classic lessons taught by W. Edwards Deming and Donald J. Wheeler, along with Mark's own experiences and lessons learned from healthcare organizations, as documented in his book Measures of Success. “Process Behavior Charts” are Wheeler's term for what have traditionally been called “Statistical Process Control (SPC) charts” or “control charts.” These charts are incredibly useful for any sort of management metric, whether they’re found on a front-line huddle board or an executive’s strategy deployment wall. If you'd like to talk about your challenges in this area through a free 30-minute phone call, please schedule time with Mark Graban. Discounted pricing is available for early adopters of an on-site workshop.